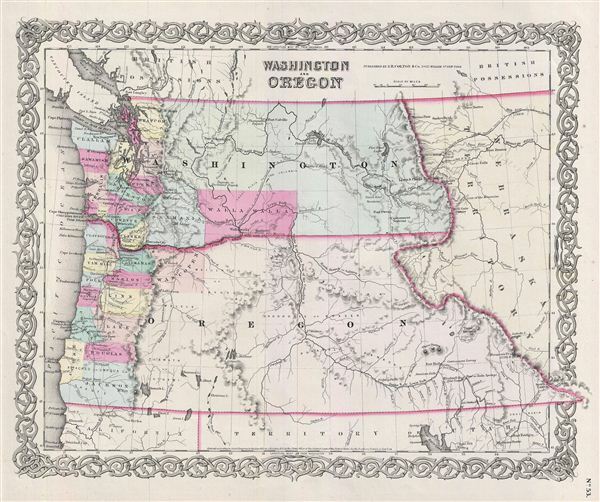 An excellent 1855 first edition example of Colton's map of Washington and Oregon. This is one of the rarest and most desirable of all Colton atlas maps. Like most of Colton's state maps, this map was derived from an earlier wall map of North America produced by Colton and D. Griffing Johnson. The map details the region between the Pacific coast and the Continental Divide, covering territorial Washington and Oregon including the modern day state of Idaho. Colton identifies a number of important emigrant and exploratory routes including Fremont's Route and the route proposed by Governor Stevens for the Pacific Railroad. On the right hand side of the map, the ephemeral Nebraska territory is drawn at its fullest extent reaching to the border with British America (Canada). Shows the territory of Oregon with much of its eastern regions unsurveyed. Washington is a massive territory extending eastward as far as the Rocky Mountains where it abuts Nebraska Territory. Most of the western part of Washington Territory, which today includes parts of Idaho and Montana, are unexplored and dominated by various American Indian nations including the Snakes, the Pa-nacks, the Nez Perce, and others. This map also identifies various forts, rivers, mountain passes, fords, and an assortment of additional topographical details. Also notes geographical features including the Tetons, Mt. Rainer, Mt. Adams, Fremont's Peak and the Three Buttes. Map is hand colored in pink, green, yellow and blue pastels to define state and territorial boundaries. Surrounded by Colton's typical spiral motif border. Dated and copyrighted to J. H. Colton, 1855. Published from Colton's 172 William Street Office in New York City. Issued as page no. 53 in volume 1 of Colton's 1856 Atlas of the World. Rumsey 0149.058 (1856 edition). Phillips (Atlases) 816.